International Healthcare Leadership (IHL) was founded at Columbia University Medical Center in 2006. IHL is an independent non-profit organization developed to link U.S. clinical and academic institutions with healthcare leaders in China and providing quality training resources. IHL's New York-Presbyterian Hospital Clinical Observership Program, Columbia University Healthcare Management Training Program, and "Fireside Chats" Sino-U.S. Physician Panel Series have helped more than 100 physicians and hospitals managers complete their study in New York. By far, IHL has set up offices in both New York City and Beijing, China. - Designing and implementing educational programs that fit the clinical and management need in China. - Building up a platform to facilitate Chinese and U.S. communication in clinical, management, and public health. - Providing tools needed by Chinese healthcare leaders to improve the accessibility, affordability, and quality of care in China. - Leveraging U.S. resources and experience to promote Chinese healthcare reform. Provide tools and training specific to China in the areas of clinical practice, healthcare policy and hospital management. Provide platform to facilitate the discussion between Chinese and U.S. healthcare professionals for both sides to learn and improve. Encourage implementation of lessons learned through the development of a leadership network. International Healthcare Leadership (IHL) was founded by Dr. David P. Roye, Jr. in 2006 to complement the work of the Children of China Pediatrics Foundation (CCPF) and directly train healthcare professionals in the areas of health care policy and management. One initiative led by the IHL program will address the need for healthcare policy and management training by developing a program at Columbia University's Mailman School of Public Health where Chinese healthcare professionals will gain executive level training. The IHL-Mailman curriculum will include, but not be limited to, health policy and management, health economics, biostatistics and epidemiology, and environmental health. Armed with the knowledge and tools necessary to address current systemic barriers to healthcare distribution, these Chinese healthcare professionals will return to their communities to provide better health services. Participating Chinese healthcare professionals will return to their communities in China with policy and management skills that will increase the number of patients treated, create policies that improve healthcare service delivery, and increase quality and safety. IHL will monitor and evaluates its outcomes to assess increased knowledge and impact a year after their return to China. In 2013, a Memorandum of Understanding was signed between the Chinese Health and Family Planning Commission (formerly Ministry of Health) and IHL to develop a Chinese healthcare management and policy program for Chinese healthcare leaders. In the same year, IHL hosted the first clinical observer group that came visit from China through IHL Clinical Observership Program. 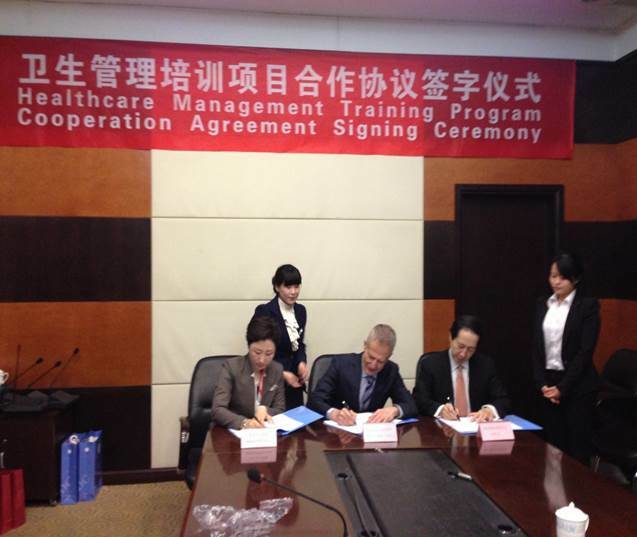 In Dedember 2014, IHL launched the first Executive Healthcare Leadership Program devoted to the Chinese Health System. The graduates of the course returned to their positions within hospitals, businesses, universities, and government organizations and began implementing and sharing their knowledge. In May 2016, the first panel session of the “IHL Fireside Chats” Sino-U.S. Physicians Panel Series was successfully held at Columbia University Medical Center. The series create a platform for Chinese and American healthcare leaders to exchange thoughts on concerned topics.